Most of the Precious Moments stuff I have is in ornament form… specifically in the form of Ariel from The Little Mermaid. DON’T JUDGE! 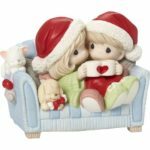 So this is really my first holiday themed Precious Moments item. I knew from when I received the figurine from my Precious Moments has Adorable Figurines for your Valentine! review that the packaging would keep the delicate porcelain safe. It came packaged exactly as the other one did – the figurine within Styrofoam in the item box, well cushioned within a larger outer shipping box. One thing I forgot to mention last time is that the outer shipping box DOES have a large Precious Moments logo on it, so if you’re ordering this as a gift you might consider having it delivered to work or a friend’s house to maintain the surprise. There are a ton of Christmas items on the site, available for purchase year-round. 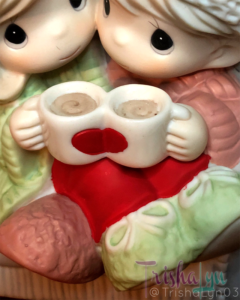 When I was looking through the selection, I was tempted to get the Nativity set for one of my sister-in-laws, but when I saw the “I Love You With My Whole Heart” Bisque Porcelain Figurine it captured my heart. In our little family, there’s me, my husband Dominic, our cat Muse, and our dog Pixel. I love little representations of actual life so I decided immediately on this one. I mentioned it before, but I really DO wish that Precious Moments would offer each figure in standard hair colors for added customization. Dominic has dirty blond hair so it works, but my very dark hair is definitely not represented with this cute little girl. Of course, Muse is black and Pixel is a pug, but I understand they can only offer SO many options! I don’t think light hair and dark hair are too much to ask. That may actually be why I don’t own more Precious Moments items – the fairness of the skin and hair never felt representative enough of myself. There’s a lot of attention to detail on this figure, but the swirls in the cocoa are my favorite. The sculptor could have just put some brown paint in there and called it a day, but the swirls add even more cozy features. There’s simple details to convey texture of all the cloth items and the couch. 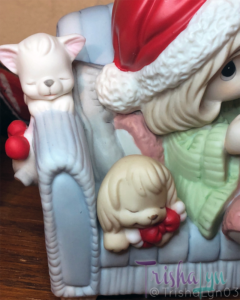 The whole figurine measures 5H x 6W x 4.5D inches, making is very easy to find a place to display it with my other little Christmas in July touches. For $80.99, this is a great addition to my Christmas decor since it sums up my little family. If the colors and animal breeds were customizable, it would be spot on! 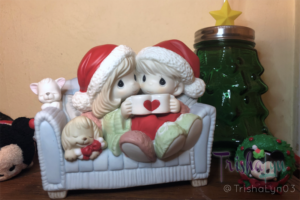 If this is a little big and their adorable ornaments are more your speed, you can order through my link, http://www.trishalyn.com/pm-xmas, and use code 2018DATED to receive the 2017 ornament for free when you buy the 2018 ornament! Hurry – this offer ends July 31, 2018!